If you have never owned or ridden a motorcycle, you may not be fully aware of the problems they face as well as the problems they might cause you when out on the road. What can be a minor collision between cars can be a serious one when a motorcycle is involved because the rider does not have the same degree of protection. It is not a “them and us situation” as we are all road users and as such we all deserve consideration. Many, if not all, riders are also car drivers but not all car drivers own or ride motorcycles. When turning onto a main road from a side junction it can be difficult to judge the speed of oncoming traffic and more so if it is a motorcycle. Try to avoid beating the oncoming bike even if you are delayed for a few moments longer. Be especially careful if stationary traffic beckons you out as there may well be a motorcycle filtering out of your view along the outside of the traffic. In situations where view is restricted by the topography or climatic conditions, wind down the window, turn off the radio for a few moments, and listen for the distinctive sound that is associated with most motorcycles. If the junction meets the main road at a slightly steeper angle, approach and position your vehicle so you can get a better view into the road. Check your mirrors as some bikers weave through traffic passing either side with little or no warning. This is dangerous and illegal, but it does happen so be aware of it. Wind down the window a little as you are likely to hear a motorcycle before it comes into view and it might be safer to wait until it has passed before making the turn. Many riders travel with their headlights on, and in a few years, doing so may well become law. Although it may, in some cases, allow you to see that there is a motorcycle on the road, it can make it harder for you to gauge the speed that it is travelling at as it breaks up the outline of the bike and rider. Be aware also that as the motorcycle travels over the road surface the headlight can appear to flicker and this can have the same effect as the light being flashed. So if in doubt, wait until the bike has passed. Some motorcycles are fitted with quite small indicator lenses that are nothing like the size you would find on the average car. Take a good look at motorcycles in your view. Wait until the rider has made the turn before committing yourself, especially in towns and near junctions. As with all vehicles there is risk of human error, and bike indicators are not self cancelling. Do not trust indicators, wait until the bike turns before you move. Motorcyclists, by the nature of the vehicle they ride, are more vulnerable to injury in the event of a collision. Unlike in a car, a motorcyclist is exposed to the elements and has clearly little real protection when involved in a collision. The popularity of motorcycles is increasing and this means there are more bikes on the road and more chances of a collision. As a car driver there is much that you can do to improve not only your safety, but also the safety of motorcyclists who share the roads with you. Being BIKE AWARE, also means that you are SELF AWARE and by considering a few simple rules when driving you can help reduce the risk of being involved in a bike related collision. Motorcyclists suffer more than most in a road collision. Bikers represent less than one percent of road users yet they suffer more than 20 percent of all serious injuries and deaths. What may well be a minor impact for a car owner, is a very serious one for a rider. In most cars you will find three mirrors and these cover most of the rear view. On a bike there are only two, and in most cases the riders’ arms restrict the view. Looking behind is also restricted because of the crash helmet. Additionally, the view available in the bike’s mirrors is distorted while the bike is moving. The clear view that we enjoy from our car mirrors is not always available to those riding motorcycles. Even if you do not ride a motorcycle, if you get the chance, go and sit on a bike and have a look at the mirrors from a rider’s point of view and see for yourself how limited a view the rider has. If you see a bike ahead, NEVER assume that the rider has seen you, it is always safer to assume that they have NOT. Motorcyclists will often filter between lines of traffic held in queues. Motorways and dual carriageways are the most common, although in any heavy traffic you are likely to see motorcycles passing between the lanes. 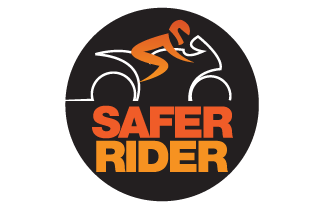 Most are responsible and keep to speeds that are generally safe although there are riders that travel too fast for the conditions. If you are considering a lane change, for whatever reason, make certain that you do not turn into the lane too quickly. Keep the view to the rear available in the door mirror and search for the motorcycle that may be filtering between the lines of traffic. Turn too quickly and without looking behind and you may not see the motorcyclist until he or she has hit you. Always use your indicators. As car drivers we enjoy good all-round visibility but riders have far less peripheral vision because of the safety helmet. This, coupled with a restricted view into the mirrors, means a rider is less likely to see you than you are to see them. Keep the glass and mirrors on your vehicle clean. It doesn’t take much time but makes a lot of difference to your view. It can also reduce fatigue as it creates less strain on the eyes helping to keep you alert. Make sure that you have your eyes tested by a qualified optician and not by a police officer at the roadside. Hearing is a problem for any road user. Car drivers very often have the radio on or may even be on the phone (hands-free of course). Bikers have constant noise through the crash helmet and very often wear ear protection to reduce the noise when riding. This may cause them to miss some warnings so be aware that a rider may not hear you even if you sound the horn on the vehicle. Drive with consideration. Extend courtesy, as it will promote courtesy from others.